You can really never have too many backups of your most important files, and since our iPhone photos and pictures often fall into the ‘very important’ category, having an automatic backup solution directly from your iPhone can be a good idea. Yes, using iCloud will back up some photos, but it doesn’t offer direct access to a single picture the way that copying them to your computer does. That’s where Dropbox can come in, offering a bit of both worlds; direct photo access, but the photos are backed up to the cloud. For the unfamiliar, Dropbox offers an excellent cloud based file storage solution that is free at the entry level for 2GB of space. Referring friends and others to sign up can net you a total of 18GB of free space, otherwise Pro paid solutions offer anywhere from 100GB to 500GB at monthly rates. If you intend on backing up tons and tons of photos to DropBox, jumping to one of the paid plans is probably a good idea, but even at the free level you can store a fair amount of your most important pictures and access them again at any time from anywhere. This is not meant to be a replacement to regular iPhone backups to iTunes or iCloud, nor regularly transferring pictures to a local computer for backup, but it does offer an excellent simple solution for another layer of backups, providing easy redundancy for photo backups that happens automatically. The Wi-Fi Only upload setting is recommended otherwise you can quickly go over your cellular data plan limits. If Wi-Fi is not found, Dropbox is smart enough to wait until a wifi connection is available before trying to upload the images again. 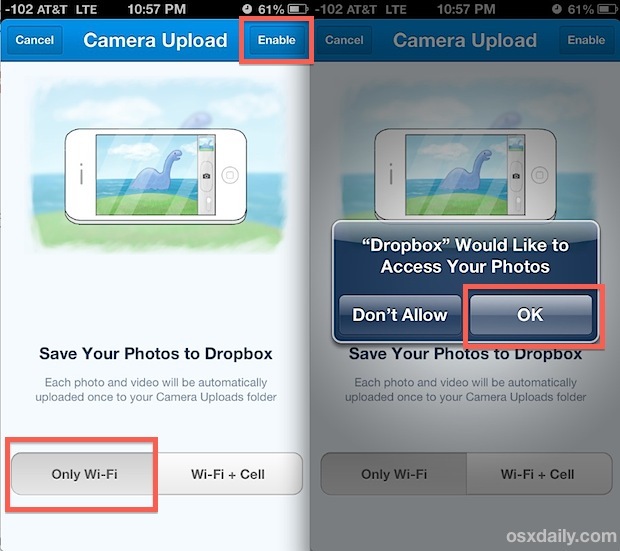 Note: if you would rather manually manage and upload photos from the iPhone directly to Dropbox, turn automatic uploads OFF from Settings, and instead handle uploads directly from the Dropbox app itself. 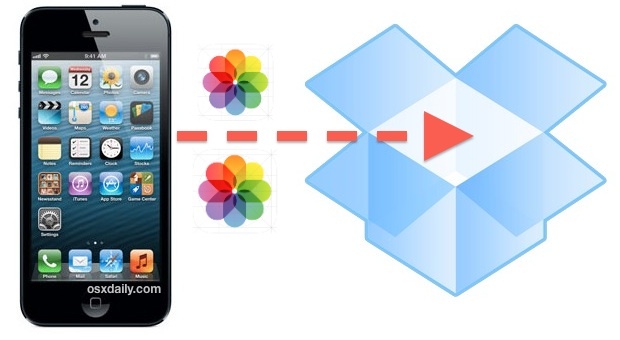 Once you have your iPhone photos backed up to Dropbox, you can access them anytime from the Dropbox iOS app on any device using the same login. 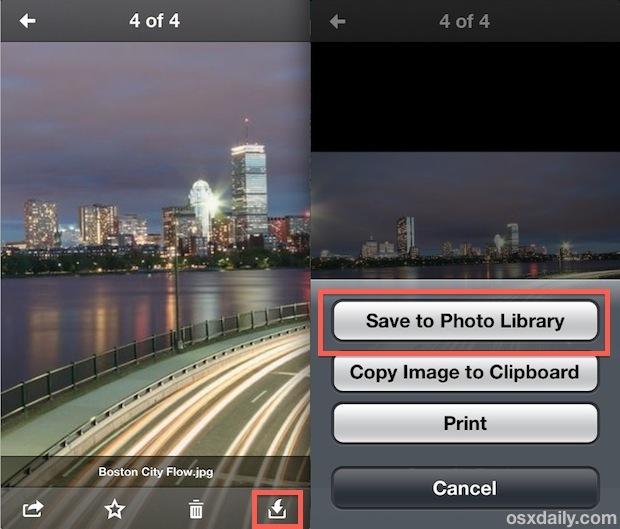 Browsing through photos stored in Dropbox is easy, and images are stored chronologically. Another significant feature of Dropbox is the availability of a desktop app (also a free download), meaning you can always access any photos or files backed up to Dropbox from your iPhone right from the desktop OS, whether that’s Mac OS X or Windows. On the desktop side of things, Dropbox behaves like any other folder in the OS X file system, providing for simple access to everything, with easy drag & drop support of uploads and downloads. For users who like direct access to files and the file system, Dropbox behaves like iCloud should behave, without having to resort to quirky tweaks to gain direct control of files like what is required when accessing iCloud from the desktop. Again, it’s not meant to be a replacement to iCloud, but it does offer some nice perks that go well to complement Apple’s backup offerings. Even if you don’t pay for a larger level of Dropbox storage, having the free 2GB plan to store some of your most precious photo memories is so easy that there is little reason not to do so. Heads up to iDownloadBlog for the idea.